« It’s always too late for someone / Crime Wave Press – The Story So Far…. 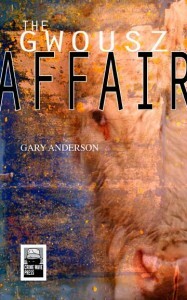 Crime Wave Press author Gary Anderson recounts how he found a home for his excellent and hilariously transgressive Sci Fi Noir novel The Gwousz Affair. I’m going start by making what might be a startling admission: I came to noir late. The Gwousz Affair is my first attempt at what might be if not partially classified as noir, then at least clearly influenced by it. In fact, I didn’t read Hammet or Chandler until a few years ago. I didn’t even watch Out of the Past and In a Lonely Place until well after my college years. Yet, I’ve recently come to realize that noir has always been with me, looming somewhere in the background, hiding in the shadows of my subconscious with a cigarette crushed between its teeth. Let me explain…. Read the full guest blog over at British crime writer’s Paul D. Brazill’s website.